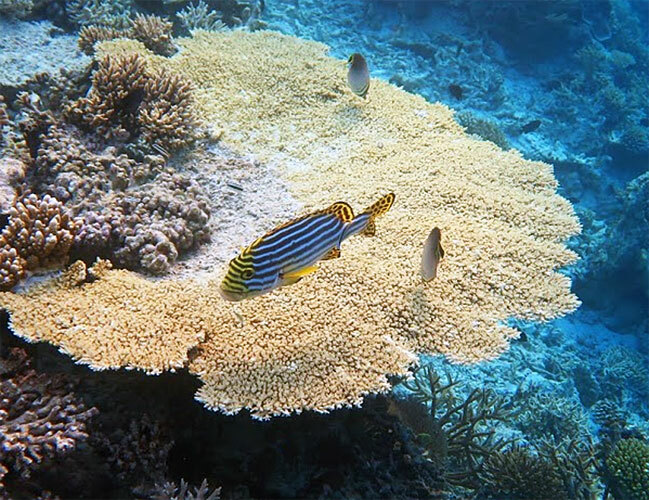 Our 30th Anniversary gave us a reason to splurge on this Maldives snorkeling trip. We booked three different islands at all different price points, as we knew nothing about them but what we read from you fellow posters and TripAdvisor. We chose Vakarufalhi, Vilamendhoo, and Conrad Rangali. The islands are gorgeous, the ocean is placid and warm, the food is great, the nighttime sky is studded with stars. And truly, the snorkeling is utterly ridiculously awesome. Am I being realistic? Yes. Like any island in the world, not everywhere on each has equal reef quality, and you cannot trust the hotel staff outside the dive shop to know where the reef is good. 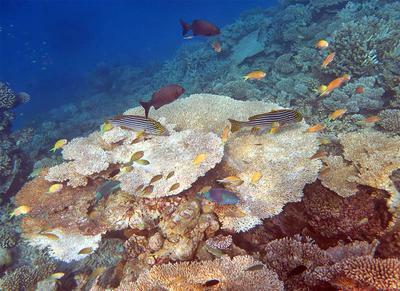 There are large areas where the coral is bleached or trampled but even at these places, there are still fish. 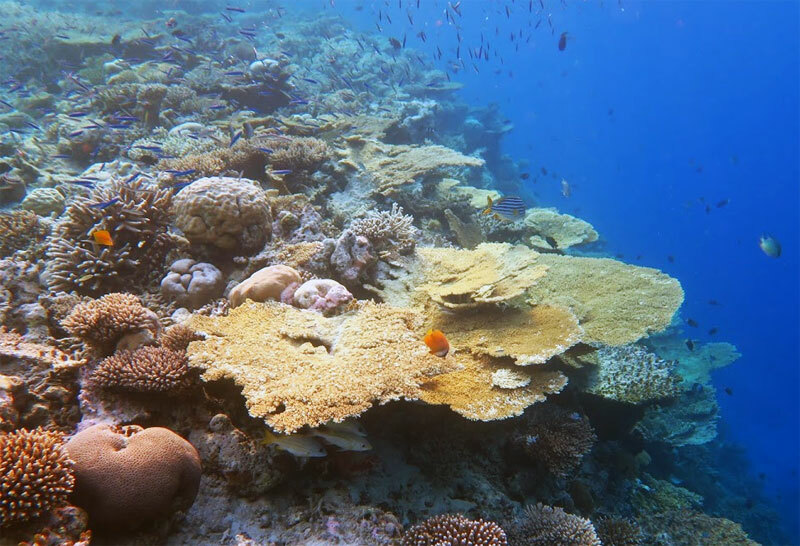 The wonderful news is that there are huge healthy areas of amazing coral. The variety of fish, though varying from island to island is awesome. The sheer NUMBER of fish is mind blowing. All sizes, all sorts. We were snorkel laughing like mad so many many times. At one point 3 separate schools of fish were swarming around us in clouds all zooming different directions, and traveling among them were good sized Bluefin Trevally. Then, from the back, a HUGE jack. Wow. One afternoon we had snorkeled around the entire island and were crossing the swimmers area when a thick school – what we’d call a bait ball - engulfed us and the swimmers. One silvery fish jumped out of the water and smacked me in the neck. A juvenile Blacktip Reef Shark was responsible for the movement of this bait ball. Earlier we’d watched the progress of these bait balls and young sharks from above. Being in the middle of one was hilarious! Blue and yellow seemed to be the theme of the trip. Blue fish, yellow fish, blue and yellow fish, blue sky, blue water, yellow orange sun sinking into blue water. 8. Fruit bats!!!! So cool! 9. Prices are often in US dollars, and US currency accepted. Odd, since we saw no other Americans! As Californian’s, Maldives is halfway round the world. Travel time was ridiculous, and next time we will stay somewhere fun on the way to cut up the journey to arrive there fresher. We had to rent a car, drive to LAX, fly 14 hours to Istanbul, 7 hour layover, another 7+ hour flight to Male. Then a short sea-plane ride to South Ari Atoll, then a short boat ride and finally we were at the first resort. On the way back we stayed at an air-side airport hotel in Istanbul where you walk from your gate to the hotel room, back to the gate and slept blissfully stretched out and even showered in that 7 hour layover. Book before going, or it’s full. Our San Diego AAA travel agency had NO info on Maldives, they said it’s too far, too expensive. And yet, Maldives beckoned us... We booked on Expedia so we could buy trip insurance. Everyone asked, was it worth the trip? Yes. With anything under 10 days to spend – maybe, maybe not. But 2 weeks, 3 islands, and a million fish later, I say YES. The sun is STRONG. Full body lycra suits (I added a skirt for style) were worn by lots of women, and even men. They can be had for about $50. No worries about rubbed off sunscreen. Worked beautifully, dried fast. Tips are truly appreciated and deserved. Maldivians wages are low. Also, please be mindful of dress, this is a Muslim country, not Las Vegas. Do NOT touch anything, coral, shells, etc. Do not put your feet or hands where you can’t see. We had a Lionfish clinging to our bungalow ladder. Don’t worry about bringing things to do. I couldn’t help but just stare at the ocean, the fish, the stars, and relax and mull over the countless numbers of incredibly diverse sea creatures we saw that day. Big and tiny, shy and bold, some with stripes, some with spots, some both spotted and striped. And I'd know in the next day's snorkeling I'd see something new, something I'd never seen before. What a big and wonderful world. 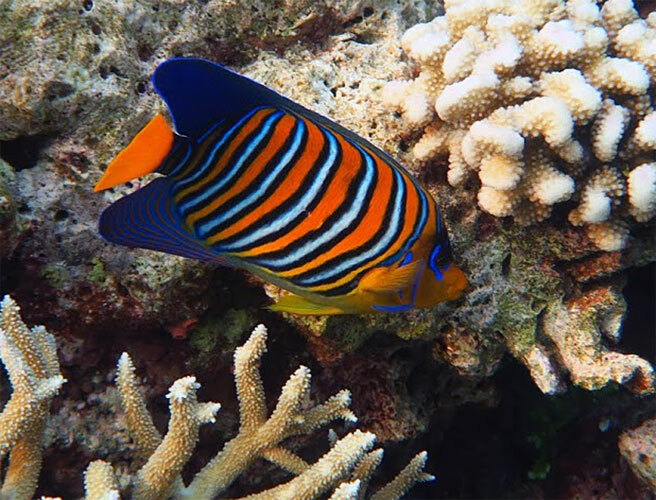 Hi Pat, thank you so much for taking the time to share your Maldives snorkeling experiences with us! We leave in less than 2 weeks for our 2 week stay and you are making us crazy excited! We will be staying at Vilamendhoo as well. 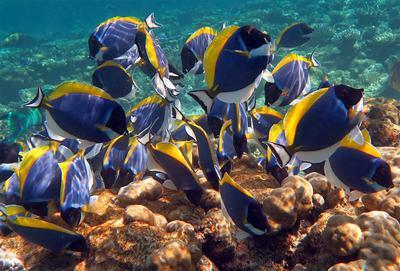 We would love to hear more specifics about the reefs and the sea life on each of the islands you visited. Any differences between them that stand out? Do you recommend any over the others? Out of curiosity, how did you go between resorts in South Ari Atoll? Did you take any pictures? We would love to post some on here if you did. 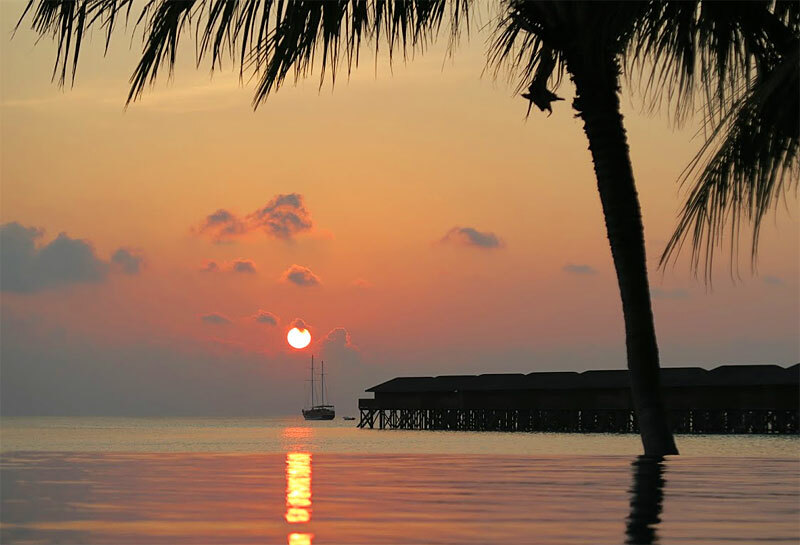 Hi there, thanks for your report on the Maldives! It's a bucket list item for me that just got moved up higher on the list. Here is a link to Nader's unedited photos on Google Drive. Just wanted to share them to fuel your excitement! Get ready to make new friends, those little 6 bar wrasse get up close and personal - one nipped Nader's ear and kept hanging in front of my mask. LOL! 1. Vakarufalhi. This is a GREAT place for snorkeling honeymooners and anniversary people. Smaller island and resort, with lovely house reef, charming resort all around at a reasonable cost. I actually booked here (over-water villa, full board) because a TripAdvisor poster said the chef was good at gluten free. True! Great food all around, but twice he did wheat/corn free special things just for me. Personable wait staff, too. We were sorry to leave. We snorkeled all around the entire island one afternoon, and had a great time. Would definitely return even if to just watch stars from the comfy chairs and listen to the water slap gently on our staircase reminding us of the school of sleeping Mullet (?) right underneath us and the adorable pipefish, sergeant fish, and baby Geographic Wrasse on the bottom step. Saw the most Blacktip Reef Sharks here and more and larger eels, as well as the trevally – I guess more hunters here in general. So much drama going on out there, watching nature. Peaceful fish moseying about, then suddenly, WHOOSH, everyone flees as a school of trevally or Humpback Unicornfish arrive on the scene. 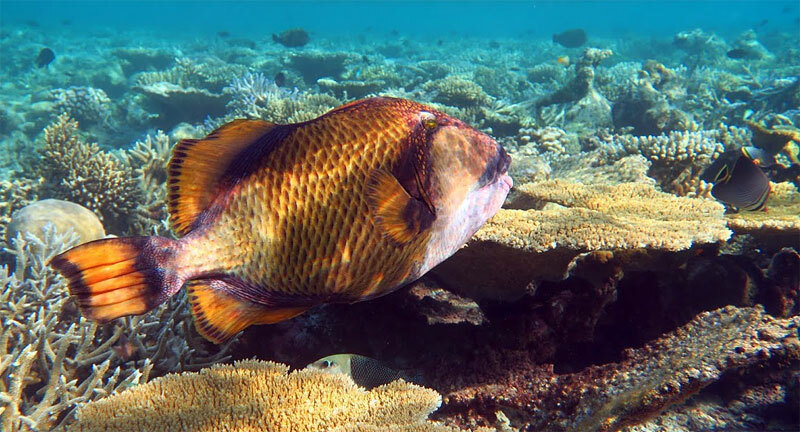 The crazily colored huge parrotfish are not as shy in Maldives so are easier to photograph possibly since they don’t allow fishing at resorts. 2. Vilamendhoo. Booked here because of reports of the best snorkeling in Maldives. Might just be true as far as islands with resorts go. It was the best coral reef we saw of the three islands. Vilamendhoo is larger, busier, with more to do and a seriously huge food selection with all dishes were marked with allergy info & for vegetarians etc. There were no over-water bungalows left when we booked months earlier so we got a beach bungalow, full board. Upon arrival we asked to be close to the best snorkeling and were given #122 on the southeast side. Our first snorkel outing on the southeast side was actually a huge disappointment. Coral was badly damaged, water overly warm, and though there were numerous clownfish and anemones on that side (lower down) the rest was pretty barren and dead. Turns out, best snorkeling is the NORTH side of the island. Would have been nice to have been told that. We then switched to a stand-alone more private beach bungalow on the southwest end of the island mainly because room 122 had shared a wall with another bungalow and oddly enough the bathrooms are OUTDOOR like an enclosed patio with no ceiling (!) so this means listening to a stranger brush their teeth etc... Not good. Happily, from a more private room 239, we found the areas of healthy coral on the southwest side, and also swam to the north reef. They seem to expect you to know that orange buoys mark entrance/exit pathways through the reef so that people don’t swim over the reef as it is so shallow. There are several on each side of the island. Swim the pathway to the drop off and snorkel along the reef edge between the reef and the deep. Sounds scarier than it is, really, I am usually a chicken but it was fine because there is such little current and the ocean is so placid. I can hardly believe how flat and calm it was. The north side has more fish and more coral but the southwest side had more of the larger fish with the hunters were hanging under ledges. 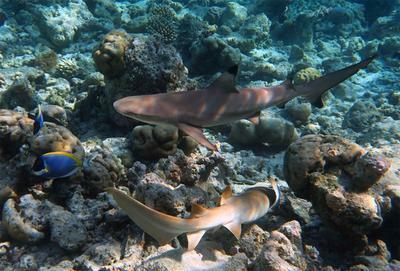 Along shore in the shallows the tiny Blacktip Reef Sharks hang out, making little fish jump out of the water. Our time was spent snorkeling back and forth along the reef, coming out for a fantastic meal, and back into the water until days end. Then we slipped into the amazing disappearing edge pool to refresh ourselves with a minty limeade (Vila welcome drink) while watching the splendorous sunset on an unending vista of blue. Blue pool, blue ocean, blue sky, and a big golden orange sun that slides down, down, down, and melts into pink and purple and blue. Awwwww. 3. Conrad Rangali. Pricey, yes, but impeccable service. We did not spring for an over-water villa here, and I am glad, because the best snorkeling at the house reef was the whole eastern side of the main island which would be a long walk or cart ride away. The snorkeling visibility was not terrific here during our stay, still, the snorkeling was very enjoyable and I was still finding new fish each day of snorkeling, though we’d snorkeled every day for almost 2 weeks. I think, though, the reason a person would take the time and money to visit the Conrad Rangali is because of the resort itself – it’s the epitome of barefoot luxury. And I MEAN barefoot. We were actually required to take off our shoes at the underwater restaurant! Imagine that, a restaurant where you MUST take off your shoes! LOL. The breakfasts here,(included in our room cost) were not equaled anywhere in our experience - EVER. Imagine if Herrods were to serve only breakfast foods from 7-11am. That’d be pretty close to breakfast at Conrad Rangali. Omelets, beef sausages, miso, cheeses, honeycomb, pancakes and maybe 25 different breads (but when I asked, they brought me gluten free). Best of all, a juice bar. Decent snorkeling, fantastic location, unparalleled service – that’s the Conrad Rangali. I feel protective about these reefs. My hubby and I felt a bit like Reef Police. Though Vilamendhoo DOES care about its reef, and has a Reef Care booklet in various languages on the bed to catch your eye as you walk into the room, it isn’t enough. Everyone ought to be given a short very explicit power point on arrival showing exactly what coral is, and that you must not step or hold onto it, etc. And maybe a short quiz to see if the message got across. One fellow, standing on the coral with his fins, said "Oh, I think they said don’t touch it with your feet." Obviously, the explanation failed to be explicit. There were also swimmers just floating around that would bump into the coral, not even realizing what they were hitting. They could be asked to stay in swim-only areas. Global warming is going to take its toll here, so we must at least keep the people from harming this valuable resource. About inter-island travel in Ari Atoll: We took the sea plane from Male to Centara (about $250/per person then a 5 minute dhoni ride to Vakarufalhi. After our stay at Vakarufalhi their staff took just the two of us the 5 or 6 miles up to Vilamendhoo in a dhoni for $100. This was fair. But then Vilamendhoo wanted $585 to take us the 15 or 16 miles over to Conrad Rangali by speedboat (1/2 hr) or $575 for dhoni (hour plus). We were VERY disgruntled they charged so much, it is not fair in the least. We took a sea plane from Conrad back to Male. I hope to return to the Maldives, but to which island? There are SO many to choose from! And flying over Maldives you see reefs with no islands EVERYWHERE and then I just imagine how heavenly traveling by boat here would be. Lucky Wendy, Galen and Nicole! Pat, Galen edited up some of Nader's photos and we have included them in your post and your comment. Thank you for sharing them! Another thank you for the detail about each resort. That is exactly what we wanted! Great pics and great report. We are doing the Solomon Islands with Wendy next year. What camera did you use? Your pics are amazing. Thanks so much for the info and the pics! Very useful. I'm also curious about the camera you used. The best photos were taken by my husband Nader with a Canon G7X in Canon housing, which Nicole and Galen discuss on this page. A couple are with my Nikon Coolpix waterproof which died the last day out though after years of service. We could take photos of the same thing at the same time, and his Canon photos were just better than my Nikon. But I really liked it's simplicity, and still ok photos. I cannot wait to see what photos Nicole and Galen are taking in the Maldives now... Bet they are having the time of their lives! YAY! I wrote an account of snorkeling in Vilamendhoo in the Tropical Fish Hobbyist Magazine (USA) in 2012 but it is still online. We are going to Helengeli North Male Aholl soon. Does anyone have any reports from there? Yes, we returned to the Maldives. After our last trip there in March of 2016 we had a rough rest of the year. Needing rest more than adventure, we booked back onto Vilamendhoo, this time early enough to get the over-water bungalow. We were ridiculously happy. I had worried about what we'd find after seeing the bleached coral in Galen and Nicole's photos from their stay shortly after we'd left. And I have to say, the reef has suffered severe damage, possibly 90%+ died and is covered in algae. The first swim out was sobering and I especially noticed the huge plate corals had mostly crumbled and fallen. Then, thankfully, I also noticed baby corals and some lobe corals that seemed to have been heartier that were alright. I am also happy to report that there were SOOOOO many fish. I don't know how long the reef can support all these fish, or if they'll be OK using the rock-like algae covered dead coral as a home. But there were vast numbers and clouds of fish there. I imagine that some species numbers have changed, but I still saw most every fish from the year before. Coolest fish from this trip? May just be a juvenile Oriental Sweetlips. Bizarre little fellow that looks NOTHING like its adult self! Also very amazing was the bat fish below our sidewalk. Big, shy, calm, and lovely. Thank you for your wonderful review! The Maldives is a place on my bucket list. Great suggestions on how to break up the long travel time!